People who attended the event said it was a huge success: there were many beautiful works of art, as well as t-shirts, for sale. There were also indigenous foods, as well as poems, and musical performances both in English and Spanish. 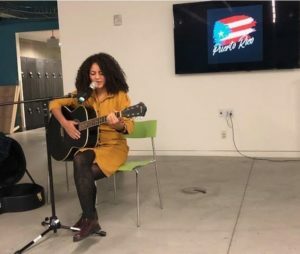 The night could not have gone more smoothly, and everyone came away with more insight into what still needs to be done in order to help and support Puerto Rico. Jobin-Leeds plans to go to Puerto Rico this December, to see more of what has been going on, and to get an update on conditions and systems of mutual support that have been put in place. I wanted to conclude with a link to the website that was shown and given out at the fundraiser. Feel free to check it out and donate money in order to help support the effort in Puerto Rico. The money will be going to food and reconstruction. You have given us food for thought by bringing to remembrance the ongoing hardship in Puerto Rico. As we begin the season of giving let us be mindful of the less privileged ones within and outside our borders to put a smile on their faces.